Provokinh China: The Dalai Lama. India has to do no more than let the Dalai Lama be the Dalai Lama in order to rile China from time to time. As diplomatic provocation goes, the Dalai Lama’s just-concluded visit to Arunachal Pradesh was quite like the six previous ones, the last one being in 2009. Yet, Beijing has chosen to respond to this visit with an outrage that feels discernibly sharper than in the past. Perhaps what has accentuated the Chinese anger was an accompaniment in the form of Minister of State for Home Affairs Kiren Rijiju. 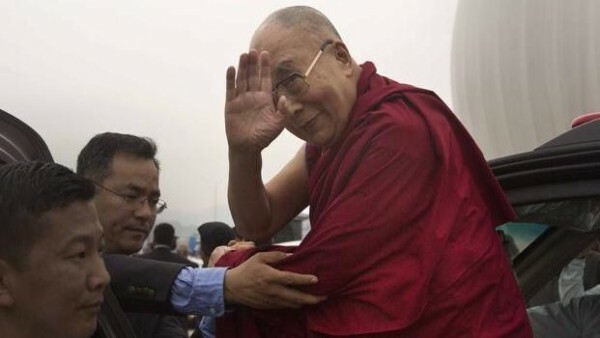 Beijing, which treats the Dalai Lama purely as a political animal even at the best of times, saw in Rijiju’s presence a calculated political dimension. New Delhi, being justifiably crafty about it, dismissed the suggestion. The simple fact is that the Indian government is now more amenable to occasionally tapping into the Dalai Lama’s obvious political consequence than before. The logic seems to be that since China treats all things Dalai Lama short of his breathing as political, India might as well make the most of it. The Dalai Lama’s visit to Tawang, the town along the India-China border where the sixth Dalai Lama was born 334 years ago, has always had unnerving optics for Beijing. Quite apart from being a border town, it is also part of what China gratuitously calls South Tibet. Left to Beijing, Arunachal Pradesh being part of China is a no-contest claim. It is because India rejects that wholly and clearly regards Arunachal Pradesh as part of the Indian Union that it sees no controversy in the Dalai Lama visiting there. Of course, India’s foreign policy establishment is acutely aware of such visits’ potential for diplomatic provocation and approved of it, not just irrespective of but precisely because of it. Although the Ministry of External Affairs insisted “no additional colour should be ascribed to the Dalai Lama’s religious and spiritual activities”, it knew well how it would be received in China. It was in a way aimed at riling Beijing by letting the Dalai Lama be the Dalai Lama. India-China relations have been going through a particularly rough patch, mainly because of a series of moves by Beijing in the past couple of years. For Prime Minister Narendra Modi, China has not been a particularly rewarding or uplifting experience despite the fact that early on in his tenure he effusively hosted President Xi Jinping in 2014 in Ahmedabad. The two sat on Gujarat’s famous lacquer-work swing on the banks of the Sabarmati river whose front Modi had developed as the state’s Chief Minister. In the intervening two-and-a-half years the Prime Minister finds the bilateral relationship not living up to its promise. From opposing India’s bid for membership of the Nuclear Suppliers Group to consistently thwarting New Delhi’s efforts to have the United Nations Security Council put Masood Azhar, the head of the Pakistani terrorist outfit Jaish-e-Mohammed, on its blacklist, Beijing has been remarkably unhelpful. This is notwithstanding that early on Modi allowed Chinese investment into ports and telecom, something which was out of bounds earlier. Add to that the China-Pakistan Economic Corridor that China is building through Pakistan-controlled Kashmir much to India’s outrage, and an earlier incursion by its soldiers into Ladakh, and a pattern seems to form. A case can be made that China has flattered to deceive in its dealings with the Modi government while making some polite noises. Even as the Modi government has taken care to describe China’s latest fulminations over the Dalai Lama’s Tawang visit as “artificial controversies”, it has equally chosen to disregard its warnings of seriously damaging bilateral relations. Although officially New Delhi would not acknowledge flaunting the Dalai Lama recognisably more than before, it could not be unaware of its consequences. It is Delhi’s way of letting Beijing know that the latter’s machinations on issues that deeply matter to India internationally have not only been lost on the government but may even be prompting a not-so-subtle counter. The crux of Dalai Lama’s visit was philosophical in terms of what he taught to thousands of Buddhists, but he did make it a point to say that the next Dalai Lama might also be a woman. On its part, of course, Beijing insists that the next Tibetan leader would be born in China. Its Foreign Ministry issued a statement saying the next Dalai Lama will be chosen by drawing lots from a sacred urn in Lhasa. The Dalai Lama has dismissed the idea of Beijing choosing his incarnation as “nonsense”. For New Delhi, the Dalai Lama remains significant leverage even though, at 81, time may not be on his side.